Joel Embiid is an expert at getting under opponents’ skin. Marcus Smart is a prime example of a player who doesn’t tolerate trolling. So what happened Wednesday night in the Philadelphia 76ers’ 118-115 win over the Boston Celtics seemed just a matter of time. During the third quarter, Embiid set a vicious screen on Smart that came with a significant side of elbow that sent Smart tumbling to the ground. Embiid, apparently not aware of with whom he’d just trifled, then turned his back on Smart. Smart immediately hopped to his feet and shoved Embiid in his lower back with both hands and what appeared to be the full force of his body weight. Embiid went flying to the ground and then made a run at Smart before the would-be fight devolved into shoving and separating, as fights tend to do in the NBA. Embiid received a technical foul for his role in the fracas. Officials awarded Smart a flagrant 2 and an ejection. The question here, of course, is how calculated were Embiid’s motives in the dust-up? The 76ers were trailing by 11 at the time, and Embiid seems too savvy hit Smart up with the hard elbow and immediately present his back to him — unless of course, that was the plan all along. The play came immediately after a personal foul on Smart in which the two got tangled up fighting for the ball. Smart got a good shove on Embiid, but Embiid flew across the court like he hadn’t just been hit by a guy eight inches shorter and 25 pounds lighter than him. Was it all another expert troll from Embiid in successfully baiting Smart in an attempt to get back into the game? It wouldn’t be the first time the 76ers center won a battle of wits. The tide turned after Smart’s ejection, with Philadelphia outscoring Boston from that point on, 60-46 to pick up the win. 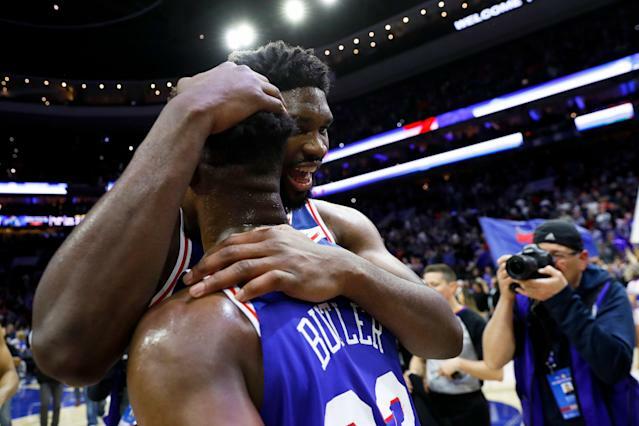 It was a satisfying win for the 76ers, who had lost all three previous matchups to the Celtics a season after being knocked out of the playoffs by Boston in a 4-1 series loss. 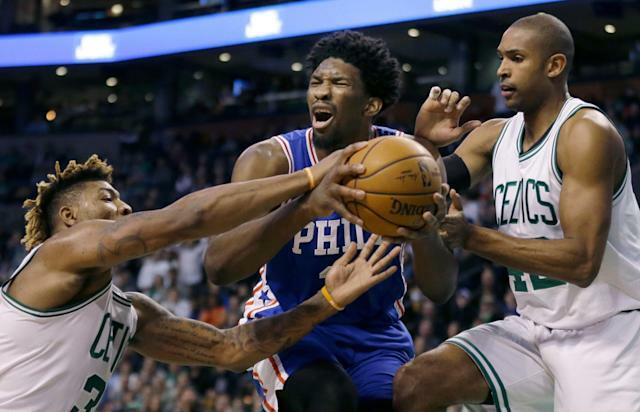 It was particularly gratifying for Embiid, who has often struggled against the defense of Al Horford in games against Boston. He didn’t struggle on Wednesday, amassing 37 points and a career-high 22 rebounds to lead the game in both categories. Philadelphia remains in third place, four games ahead of the Celtics and six games behind the first-place Milwaukee Bucks. Marcus Morris: "What's season series?" The Sixers did get a game. We wouldn’t object to seven more games between these two in the playoffs.